Certainly, frozen food is really an easy solution. What’s simpler is open the door of the freezer, store food, close the door, then freezing is done alone. However, it is not so obvious if you want to make the most of the quality of your food after thawing. We will discuss here-below the elements to take into account when freezing your food products. Before freezing a food, take care to choose your packaging because it is the key to preserve the best freshness. Use only a package that maintains the moisture of the food. Few people know, but at low temperatures, poor or unsuitable packaging will dry out your food. It is essential that your packaging is completely sealed especially to prevent the mixing of odors. By removing air from your packaging, the food is protected from drying out (freezer burn), oxidation (reaction with oxygen) and the penetration of microorganisms (microbes) during storage. 1. It must not be toxic to the food. This feature is indicated by the logo with the stem glass and the fork. 2. It must be resistant to cold and not become brittle or porous at low temperatures. 3. It must be heat resistant and dishwasher safe if you want to reuse it. 4. It must be airtight to keep out oxygen, moisture and odors. 5. It must be totally odorless and neutral in taste. 6. It must be resistant to fats, acids and salt. 7. It must be strong and not tear. 8. It must be adapted to the size of the frozen food. 9. It should be suitable for defrosting processes such as boiling water, microwave or oven. 10. It must have good shape and size. Parchment paper, clear film or similar packaging materials are not suitable for the freezer as they do not meet the above criteria. If food is not packaged enough or not at all, this leads to so-called freezer burns when temperatures are below 0 ° C.
Moisture from the food escapes and settles as ice on the colder parts of the freezer. This loss of moisture dries up the food and makes it lose all its organoleptic qualities. Your food changes taste and appearance, which is no longer just as appetizing! The choice of an adequate packaging is therefore essential for the good preservation of your food. This is the only way to fully enjoy the quality and freshness of your products even if they are stored for a long time in the freezer. Another tip is that let your contents cool completely before closing the package, this will prevent condensation and frost formation. Do not forget to stick a label with the date of freezing to locate them more easily and let customers be informed about the timing. 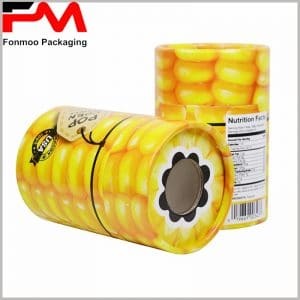 With the right packaging, you can fully enjoy the freshness of your food for vending.